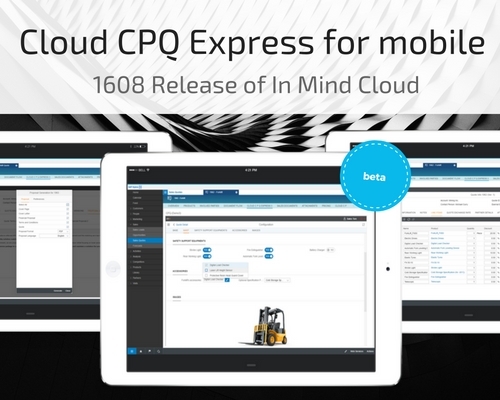 In Mind Cloud is presenting Cloud CPQ Express for mobile beta! 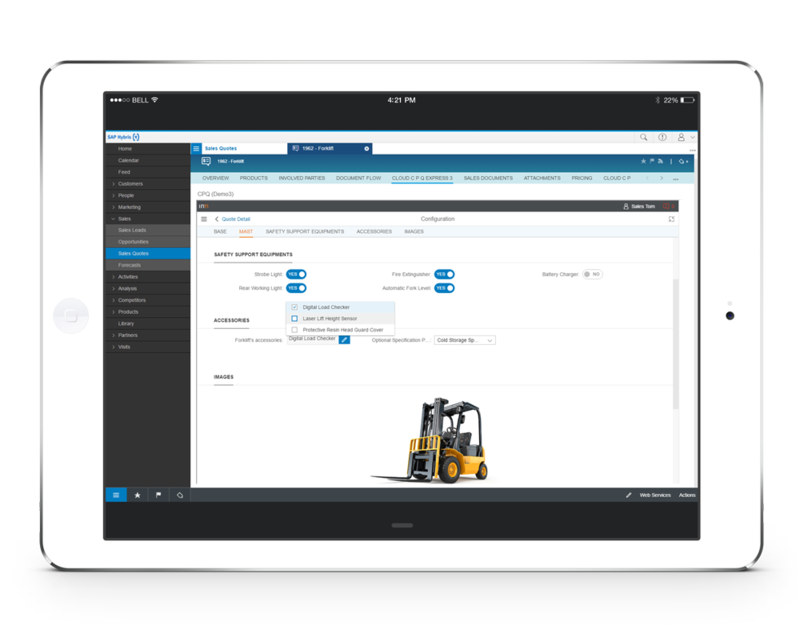 Our Configure Price Quote solution for SAP Hybris Cloud for Customer is now optimized for easy navigation and data interaction on a touchscreen like a tablet or iPad. a) As a Sales Representative, you are meeting a customer at his premises and need to give him a first cost estimate for a configurable solution. b) As a Sales Representative, you are finishing up a quote on the go and create a proposal PDF to send to your customer directly from your tablet. c) As a Business Developer Representative, you are on a trade fair or networking meeting and need ad-hoc data access to your products and prices to make well-informed statements towards prospects and potential customers. d) As a Sales Manager, you are on the go but need to review configuration details and approve prices and discounts of a quote for your sales team to proceed with an urgent proposal. e) Or as any of the roles above, you want to boost your efficiency and get work done outside the office and without setting up a workstation. 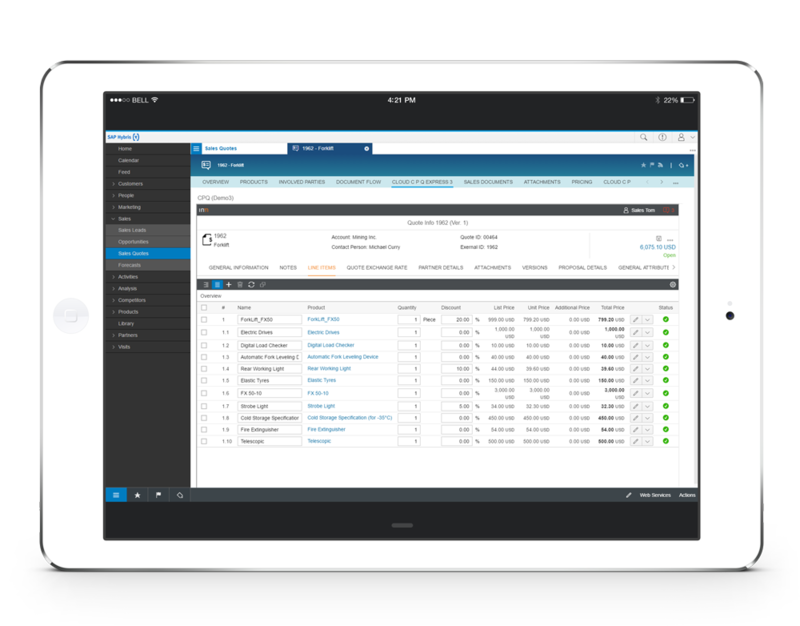 The intuitive user interface does not only increase productivity but users also benefit from a faster UI load and improved performance of our CPQ solution. Furthermore the 1608 Release brings enhancements and improvements in terms of the SAP Hybris Cloud for Customer integration, approval engine, permission engine and selected platform features to improve performance and bring in further bug fixes. These are just the highlights of the 1608 Release, if you do have any questions referring our features, this update or our further capabilities, feel invited to drop us a comment below or send us an email!